Eating patterns involving intermittent energy restriction (IER) include 'intermittent fasting' where energy intake is severely restricted for several 'fasting' days per week, with 'refeeding' days (involving greater energy intake than during fasting days) at other times. Intermittent fasting does not improve weight loss compared to continuous energy restriction (CER), where energy intake is restricted every day. We hypothesize that weight loss from IER could be improved if refeeding phases involved restoration of energy balance (i.e. not ongoing energy restriction, as during intermittent fasting). 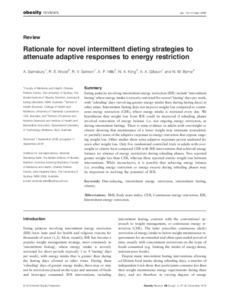 There is some evidence in adults with overweight or obesity showing that maintenance of a lower weight may attenuate (completely or partially) some of the adaptive responses to energy restriction that oppose ongoing weight loss. Other studies show some adaptive responses persist unabated for years after weight loss. Only five randomized controlled trials in adults with overweight or obesity have compared CER with IER interventions that achieved energy balance (or absence of energy restriction) during refeeding phases. Two reported greater weight loss than CER, whereas three reported similar weight loss between interventions. While inconclusive, it is possible that achieving energy balance (i.e. avoiding energy restriction or energy excess) during refeeding phases may be important in realizing the potential of IER.